The average consumer is bombarded with dozens of marketing messages every day. It’s impossible to stay focused on any one for more than a few seconds because there are just so many. How can you compete in a noisy, messy environment like that? For most small and medium-sized businesses, it’s too much. Fortunately, with the right approach to digital marketing, you can leave behind the “blast and collate” strategies of the past. Stop casting such a wide net that you may as well dig up an old phone book. Content marketing is the marketing tool of the future. Identify the biggest problems your target audience has. Create awesome content to solve those problems. 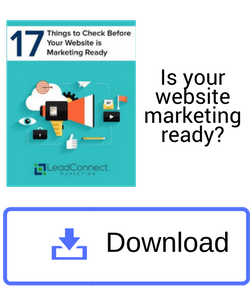 Sit back and collect contact information as people download your content. Good content marketing is about creating something incredible that speaks to your target audience in a way that few can do as well as you and your brand. This is the cornerstone of modern internet marketing. It taps into your innate expertise in the field of technology, software, and advanced services and provides prospects a reason to connect you with you even before they are ready to buy. The end result? More leads and more sales. LeadConnect identifies the key personas of your target customers or clients and the specific problems and concerns they have. We hone in on exactly what they are looking for and how we can establish you as a true trusted authority in your industry. Whatever format of content is going to resonate best with your audience we work with you to create and deliver. This content builds trust and gives us a hook with which to generate real, cynicism-free interest in your products and services. Learn more about the role of content in inbound marketing here.